One of the dining rooms at the Inn Victoria in Chester Vermont. Last week my family and I were at last able to use a gift certificate that we were given a year ago last Christmas! Dear friends from England had carefully researched on the internet where we could go to have a British tea experience right here in Vermont and gifted our family a certificate for "High Tea" at the Inn Victoria in Chester, Vermont, about an hour's drive from our home. They didn't know that Chester is also home to our favorite quilt store, Country Treasures and so we were just waiting until we could coordinate four busy schedules for this perfect day's outing. Last week, though sadly missing our youngest daughter, we worked to schedule this special occasion. We called and made reservations for "High Tea" and we were not disappointed! Pulled from an old scrap book. Formal Job's Daughter's Teas in the 1960's! Me as "Honored Queen" in Job's Daughters, with invitation honoring me! I hadn't been to "a tea" in many a year, not since I was in high school. I was in a Masonic affiliated young women's organization called Job's Daughters. Every six months the elected "queen" would be honored with a formal tea. 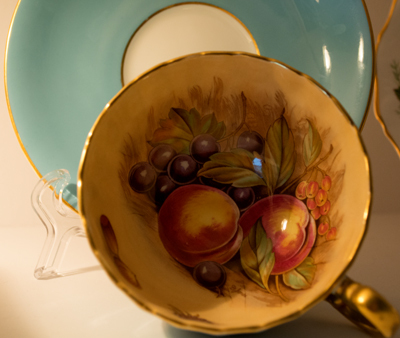 Punch was served from a glass punch bowl, along with tea or coffee, little finger sandwiches, and fancy cookies, nuts and home-made mints, which was all very elegant but not officially British. Our galas required dressing up and wearing high heels and gloves and those giving the tea and the "honored queen" wore formals. Such events, I think, are unheard of in rural Vermont where boots and warm woolen mittens is "proper wear" to any occasion in the winter months and spring and summer events are equally informal! 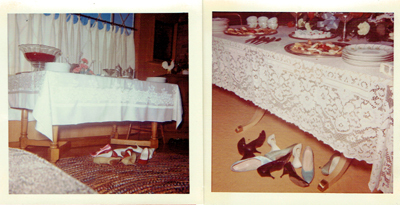 Tradition was to get a picture of our heels at the end of our tea parties. We didn't really know what to expect, but after a couple of hours of shopping at our favorite quilt shop, we were more than ready to sit down and be served. The Inn Victoria was only doors away from the quilt shop and like all buildings in the little Vermont town of Chester, the inn was an old and charming building. 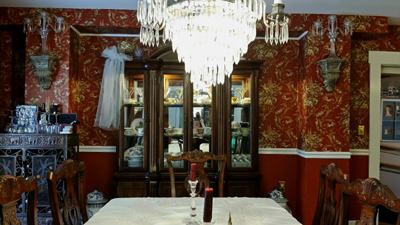 Its windows were covered with lace curtains and Victorian style drapes. Its decor was well matched. Old Victorian style lamps, sofas and chairs created a warm and welcoming setting. Formal sorts of old pictures, and china cupboards lined the walls of its dining rooms where large antique tables covered with linen tablecloths awaited us. 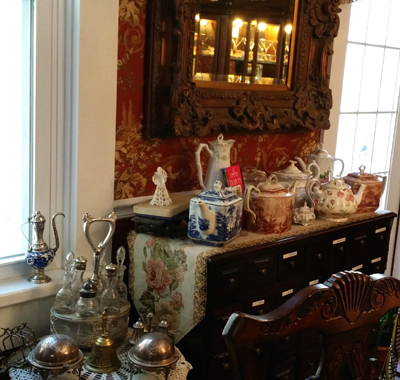 Antique style paintings and tea pots, decor at the Inn Victoria. 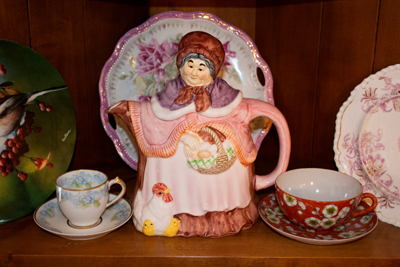 The owner greeted us and gave us directions to choose a cup and saucer from one of her many china cabinets. Nothing, to me, is as personal as having a fancy cup from which to drink your tea. 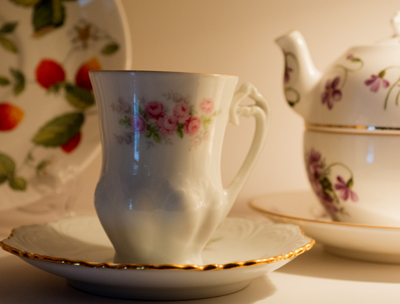 I immediately felt this woman to be a kindred soul and noted the fine china teapots covering the tops of her tea cabinets as we were seated at the end of an old table. We were given tea menus to select our individual choice of tea. Some of the many tea pots displayed on top of this tea cabinet! Out came a three tiered tray filled with fancy treats and placed before us. 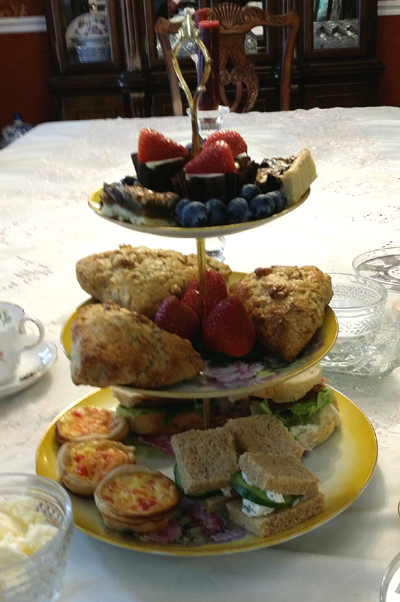 Tea sandwiches, all traditional to "High Teas" were on the larger bottom plate along with tiny individual quiches. The next tier held three large English scones with fresh strawberries, and the top tier held sweet treats all beautifully served with fresh blueberries and strawberries. After we ordering from a menu of many pages or exotic teas, we were each served a whole pot of tea, each pot as unique as our cups. It should be mentioned that in selecting our teas, the owner took time to let us smell our selections and when our pots arrived, we were quick to re-smell our brews and sample each other's choice. Helping ourselves to our delectable treats as we sipped. Being the glutton that I am, I inquired as to whether or not the treats were to be shared with anyone but ourselves, and was delighted to hear that they were all for us!! Our tea cups were all different and we each had a glass tea-light pot warmer. All the delicious treats just for us!! Cucumber and special cream cheese with seasonings were the first sandwiches, each made without crusts. These were followed by bacon, lettuce and tomato sandwiches on a crispy crusted bread--all no bigger than a couple of bits!! Then the tiny cheese and red pepper quiches. Soon we were cutting our maple walnut scones served with "clotted cream", a new experience for me! Our "sweet treats" were tiny cheesecakes served in a candy wrapper paper like those papers found in boxes of chocolates. Our last treat was a pecan chocolate chip bar cookie, ever so rich and satisfying! The fresh strawberries and blueberries were more than garnish, each delights to our taste buds! Our tea was kept hot, perched on little candle-warming glass stands. We couldn't have relaxed more if our pots had been filled with liquor instead of tea! Sipping hot tea and nibbling as we chatted was ever so fun!! By the time we finished, we were ready to call it a day and make our way back home. The very next day, my daughter emailed me an invitation to participate in adding to her new Pinterest site called, "Afternoon Tea". She had pasted two recipes for tea treats, and it wasn't but an hour later, that I had posted at least a hundred pictures of elegant tea pots, cups and saucers, tea information and tea treats!! We were onto dreaming of hosting our own tea parties in the future! 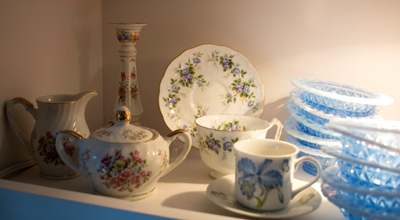 Some of our own special bits of fine china used for our tea parties at home. It wasn't until the next day that I realized that we had come full circle. I remembered tea parties with our girls when they were so little. Small tablecloths would be spread on the living room rug along with candlesticks and a tray of goodies with a small pot of tea, juice or hot chocolate with matching tiny china cups. 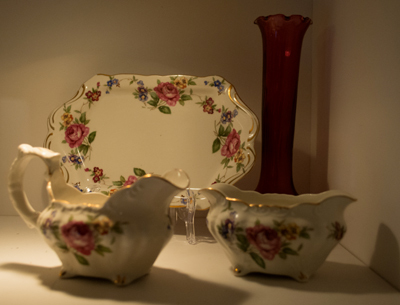 My mother has given me this special hot chocolate set along with special tea cups, reminisce of the special cup that was used to serve her hot tea whenever she or her sisters were ill.
My mother's special cup that she was served tea in when sick as a child. A little hot chocolate cup with individual tea pot/cup on the right. My mother's little antique sugar and creamer with tray. An elegant tea cup gifted to me by my mother! 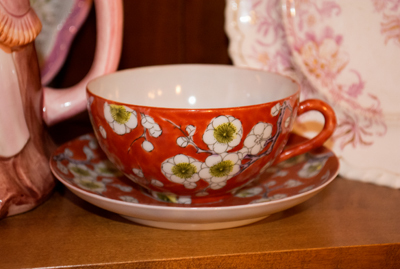 My special china collection has grown to include special fancy china tea cups, creamers and sugar sugar bowls, as well as other interesting tea pots. I had forgotten about using them and taking time for little celebrations. Future tea parties are now being actively planned again. 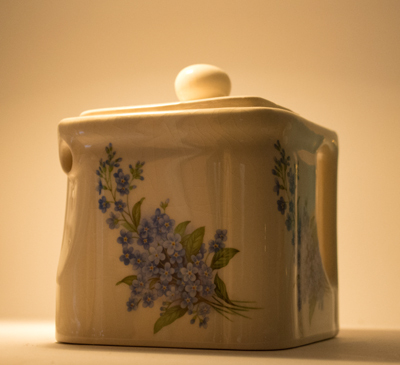 An individual tea pot, a gift from my daughter. My favorite tea pot, my dad's demitasse cup and my mother's special cup. My oldest daughter went home and told her new "step boys" about our "High Tea" and they are ready for the experience, and proudly added that they will use their best newly acquired manners, in case we doubted their readiness for the experience!! I emailed my friend in England to let her know how life-altering our experience had been and she emailed me back with a picture of her youngest granddaughter whose face was covered in chocolate from her chocolate covered tea biscuit from their "afternoon tea". How nice to experience the British in us all! What an elevating experience, capturing special moments and "be in communion" with loved ones! No more cup of joe "on the run" if I can help it!! 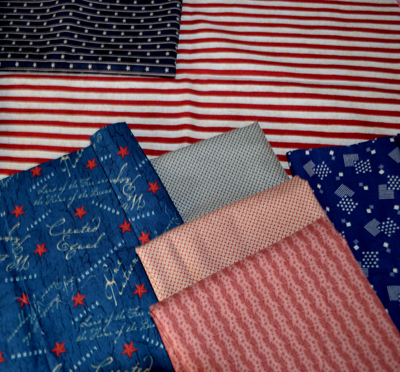 Fat quarters of fabric from Country Treasures quilt store to add to my stash! 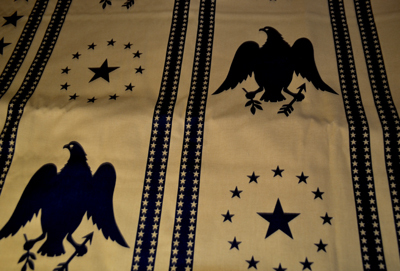 Country Treasures had a Civil War quilt with stripes of this stunning material! (In case any of you are interested in such a lovely "day-out" for yourselves, please look on line for Inn Victoria in Chester, Vermont as well as Country Treasures (quilt store) at www.vermontquilting.com. It truly made for a perfect little vacation!! But perhaps making it a weekend and staying at the inn would be even more fun?! Labels: High Tea at Inn Victoria in Chester, Vermont: British tradition of tea and fellowship--real communion experience; Country Treasures quilt store.